Arguably Nike’s most celebrated release of last year, Nike continues to roll out brand new colourways of the celebrated React Element 87. Designed by Nate Jobe and the Nike special projects team, the React Element 87 features responsive REACT foam cushioning and an inside-out “deconstructed” aesthetic. The inspiration for the style came from drilling holes into the foam of the sole unit, with the aim of attaining greater levels of comfort while standing, walking, shifting and sprinting. These trials allowed designers to determine which hole depth and densities accomplished their comfort goals. The team then applied the abstract outsole to a retro Internationalist-inspired upper – constructed from 100% TPE textile yarn – to complete the React Elements’ translucent profile. This latest ‘Royal Tint’ colourway features a contrasting combination of light blue and ‘Wolf Grey’ up top, accented with hits of neon pink stitching around the heel counter. 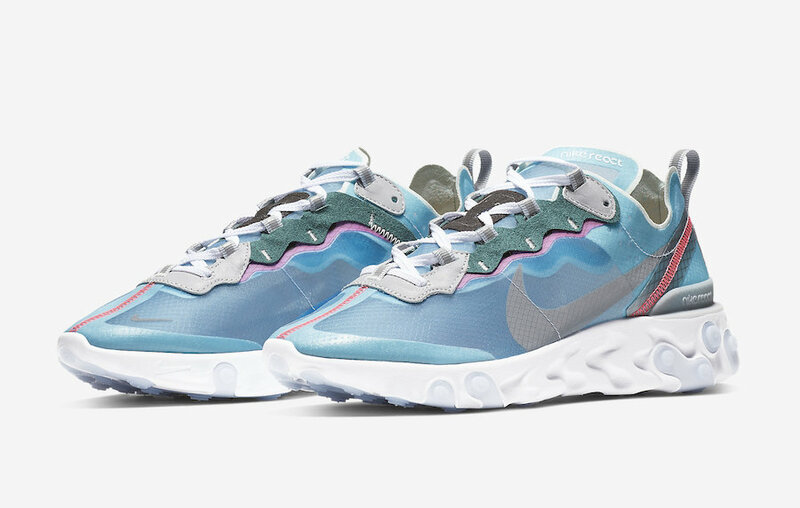 The Nike React Element 87 will be available via the size? previews app and selected size? stores on Friday 15th February, priced at £135.